Moldova Agroindbank, also known as MAIB, is the leading systemic bank in Moldova, an Eastern European country sandwiched between Romania and Ukraine. The bank holds a market share of over 30% and maintains a nationwide network of almost 70 branches and over 100 agencies. The deep financial crisis that the country faced over the past years helped MAIB emerge as a stronger institution, step up its market positions, and carry out a deep internal reorganisation process. Throughout this period, MAIB optimised its regulations, put in practice all legal amendments and worked closely with clients to help them adjust to the new conditions of the banking market. It improved the quality of its loan portfolio, and ensured a continued growth of its assets, which topped 1 billion euro by the end of 2017. The bank was the first in the country to provide Internet Banking service to its customers. It is also the exclusive issuer in Moldova of AMEX cards, in addition to Visa and MasterCard, and is known for having one of the safest AML multilevel IT solutions. Laying the emphasis on innovation, MAIB is keeping pace with developments in the fintech industry. As Moldova’s central bank conducted a systemic reform, the bank has been constantly improving its corporate governance principles in line with legal changes and best international practices in order to ensure responsible, efficient and transparent activities in the best interests of its stakeholders. Being highly aware that a partnership between business and society is the key to sustainable development, Moldova Agroindbank is committed to a number of large-scale social responsibility projects, which it has been backing for years, thus contributing to the development of Moldova’s education, culture and healthcare. Currently, MAIB is expecting a fit and proper investor for over 41% of its shares. This development, which is expected to take place soon, will put an end to shareholding transparency issues and will help MAIB finally regain access to foreign financing. The main task of the management team, however, will remain the same: to ensure the good management and sustainable development of MAIB. The long-term strategy of the bank is expected to open up new development prospects and strengthen the potential of the bank. It is no longer a secret that the bank has been planning, and is working to enter, other markets to ensure its further growth. “We would like to test our capabilities on other markets, given that the Moldovan market is very small and its development potential is limited. 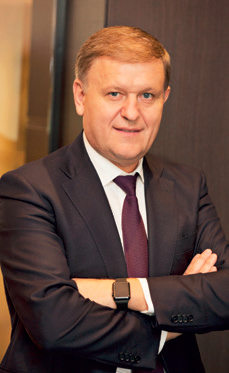 Therefore, the development strategy of our bank provides a solution to a specific issue: entering other foreign markets,” MAIB CEO Serghei Cebotari says. In line with its strategy, MAIB has announced plans to turn into a regional financial group. Cebotari is hopeful that the new shareholders will share the same views on the bank’s development strategy and will back its expansion plans. Moreover, he is hopeful that a change in the ownership structure will make it possible for the bank to get listed on European stock exchanges, noting that the bank’s strongest point is its quality in all aspects.